I started two new projects this week. Both of which I am having mixed feelings about. This is the first one, Blackbird Designs "Midnight Watch". I have loved this design for a while now, and can never resist Halloween stuff anyways. But my LNS did not have the right color thread for the moon. It called for Crescent Colors "Gingersnap" and instead I am using Weeks "Baby's Breath". I think it is a little more pink than it should be, and am starting to wonder if I should rip it all out and start over. Also the linen I am using is obviously blue instead of the khaki color the chart was stitched on. I think the blue is making my moon look even more pink. What do you think? Does anyone else have a go-to pretty color they use for moons? I actually have two other projects right now with moons in them (LK "Halloween Rules" and BC "Halloween House" and I have yet to find a white I really like. 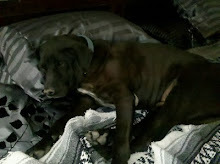 And this is what has kept me so busy the last two weeks. End of school, and graduations, and getting ready for summer vacation. My littlest one graduated from preschool and will be going on to kindergarten next year. Also my oldest is switching schools next year, and it just seems like a lot of changes for our family. Good changes, but I will miss both of their previous schools. 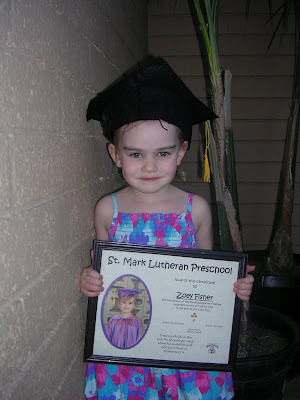 During preschool graduation they were talking about how she would be in the class of 2025, and wow that seems so far away and also way too soon. I can post my home-made mother's day present (to my own mom) early, since my mom is for the most part computer illiterate. But she does love hummingbirds, and what mom doesn't like home-made presents. 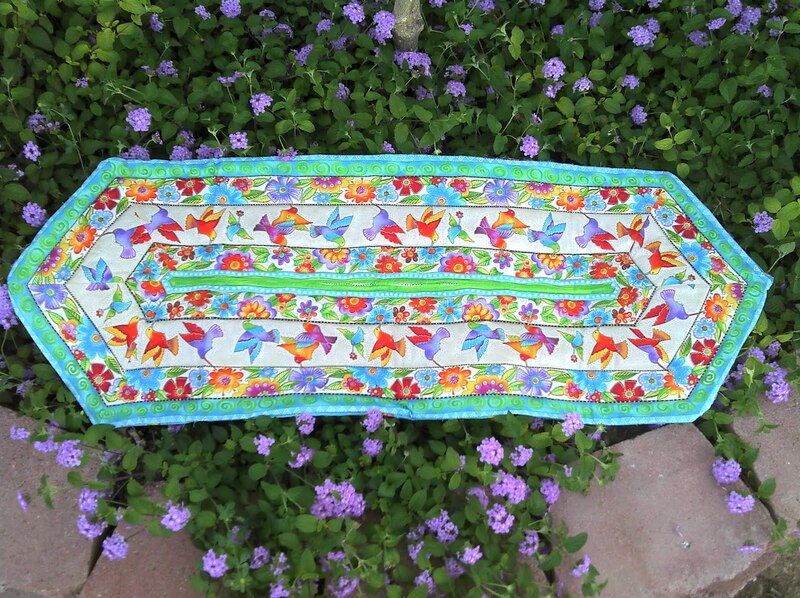 This is a table runner I made using the Easy Striped table runner pattern, that was surprisingly true to it's name "easy". I always get nervous making things that involve angles or things lining up perfectly. 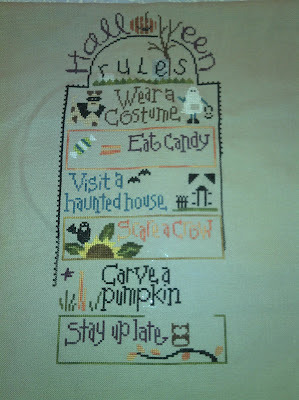 To put it mildly I am not detail oriented, and if it involves more than 5 directions I rarely get past step 2. 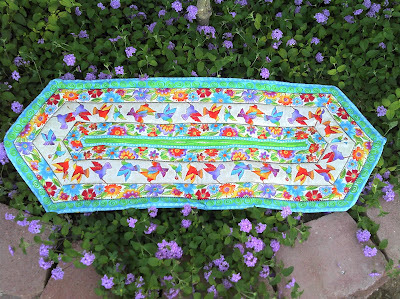 This pattern actually did only have 5 steps, and it called for a funky little triangle ruler which wasn't that hard to use either for a first timer. So I am more than pleased this project turned out so well. And no the makers of the quilting ruler/pattern did not endorse me to say any of this, I am not sure any quilt co would want someone endorsing them who can barely sew a pillow. And this is my renewed progress on Mirabilia's "Petal Fairy". Can you see I stitched the side of her skirt first to make sure it fit? 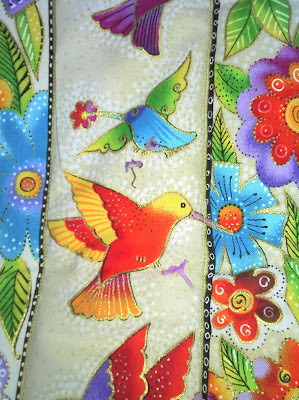 One surprising thing about this pattern for me was that on the photo her skirt looks yellow and pink. In reality (so far of course) most of the threads in her skirt are more tan/maroon. Still lovely though, and I am excited to see what she looks like finished. I hope everyone out there has a very happy Mother's Day! Let's start with the good shall we? 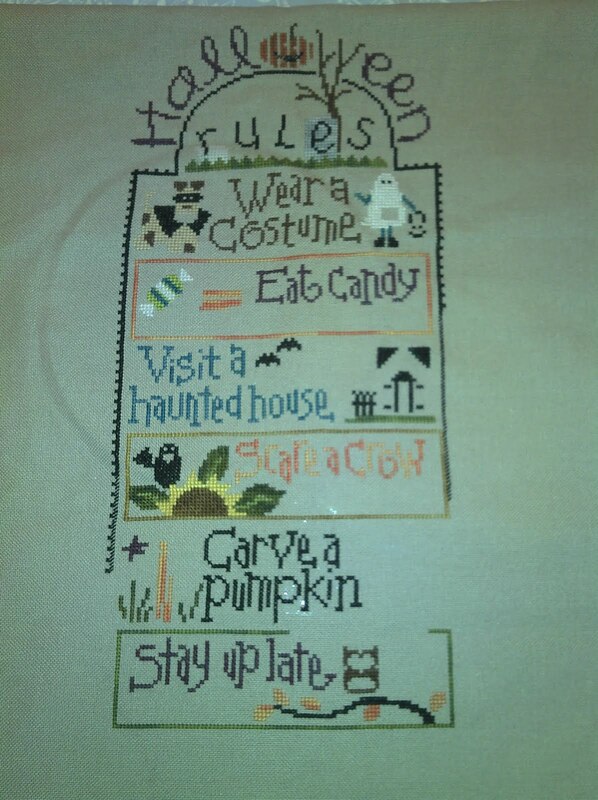 Lizzie Kate Halloween Rules is still as fun as ever to stitch on. I am thinking I will be ready to order the next three charts by July. My two favorite parts so far are the sunflower with the crow, and the little masked dog at the top. 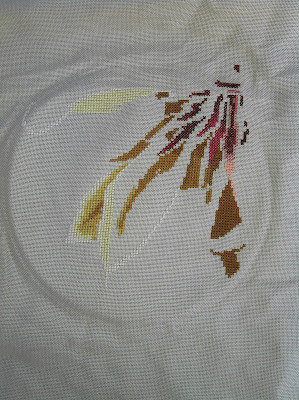 I feel so much more motivated to stitch when I can see finished bits and how cute they are. Next we will go with the bad. I have been doing a bunch of stitching on a new exchange that I really really like, and of course can't show any pictures of. Last exchange I forgot to take a photo before I mailed it out and was soooo mad at myself. And of course I remembered right as I was strolling out the post office doors too. Also this exchange is due to be mailed out right when we are on our summer vacation, so I HAVE to get it done a little bit early. And I will end with the ugly. Or how about the just plain ridiculous. 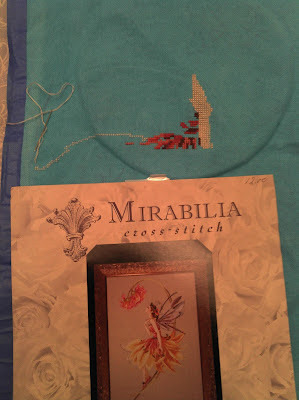 This is one of my CJC stitches, Mirabilia's "Petal Fairy". Can you see where it went wrong? Apparently I can't be trusted to pick out my own fabric, and I can't be bothered to use one of those nifty stitch calculators that are out there all over the net! I do clearly remember way back in January when I started this measuring it with a ruler and saying "hmmm I think it will fit". 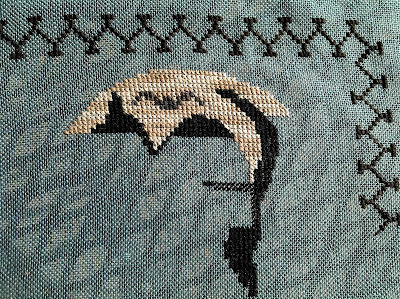 Well, yes it would have fit if it was 32 ct linen and if I had noticed that the measurements were just for the stitched area without any extra for things like framing. Luckily in the 5 months since January I have only really put 2 days of work into this before I noticed it wouldn't fit. 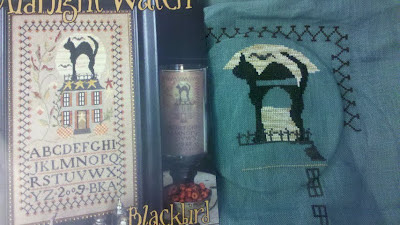 And also I found the right fabric last night at Hobby Lobby (who knew they carried Wichelt..and why didn't you tell me?) and I like the new color a little better than the bright blue I was inspired to use before. So life and stitching goes on. 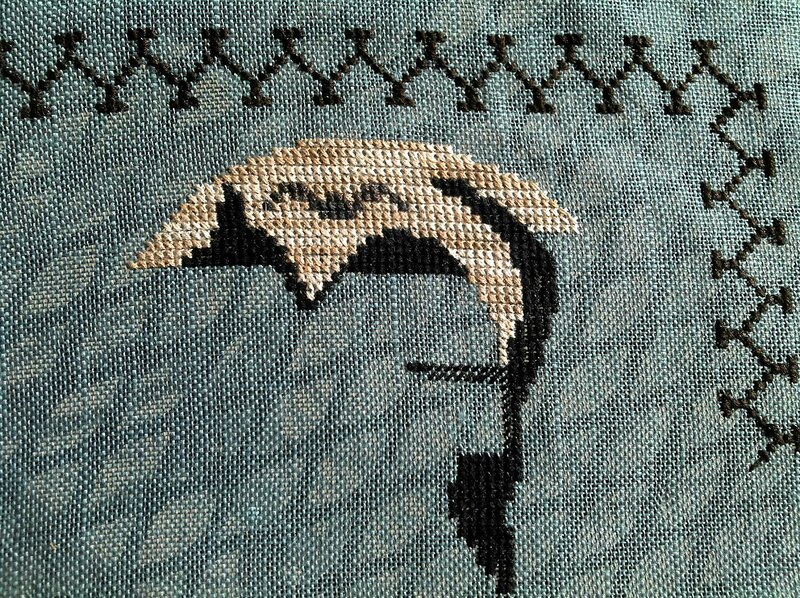 I already started stitching her again last night, and this time I made SURE I had the right size linen. Lesson learned.